This topic contains 10 replies, has 6 voices, and was last updated by Universal Head 2 years, 7 months ago. I’m on a roll! Compared to the Games Workshop figures, these were blobs of plasticine. But that did make them very quick and easy to paint. Right-click to open in a new window to see a larger image. Is that Blood and Treachery? 3-4 players eliminates that for me. Despite being blobs of plasticine, they look fine painted. The expansions let you play with 6 players or even more. Great game. You’re good, UH. You even make blobs of Plasticine look good. Sigh. Wish I could paint like that. Thanks guys. Seriously, there’s no great talent to it, just long practice. It’s just base coat, wash, and highlight, and in this case the highlights are pretty rough. Using a head loupe lets me see very close up, which helps with detail, though there isn’t much fine detail on most of these. Pretty good detail and magnificently enhanced by your brushwork. I think you’re being over modest. Your choices of color is spot on with these. They look great. And yes, this is a great game. These were some of the first “serious” minis I painted. 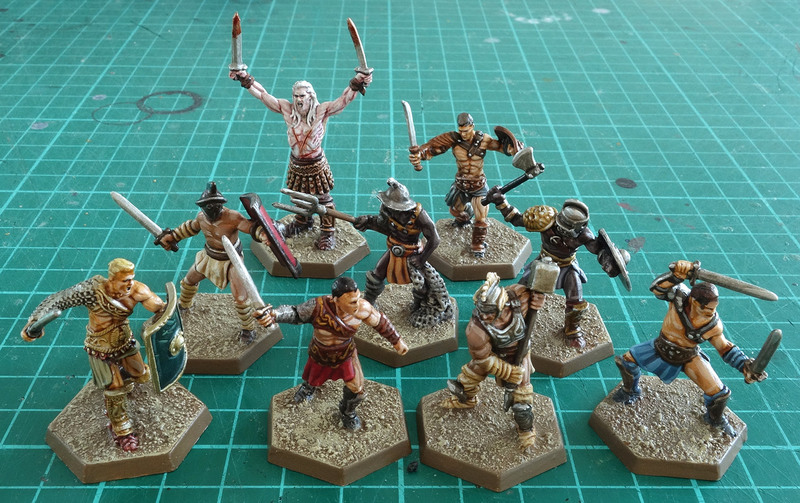 Before this, I’d only ever painted Zombicide zombies. Looking back now, it’s funny to think about how highly I thought of these minis at the time. Is it good with just the base game…or does it need the expansions? On the fence with this game…. @soulsorcerer: It’s good with just the base game. @wonderslug: Gorgeous work! You put in a lot more effort than me, and they look fantastic. I think I’ll have to splash some blood on mine now.